NEW YORK (WABC) -- Mayor Bill de Blasio is trying to calm the fears of New York City's Muslims over a Trump presidency. 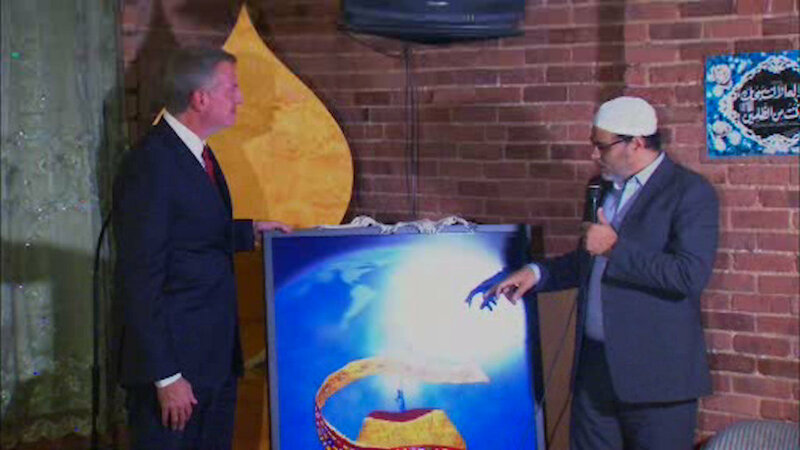 The mayor delivered remarks at the Islamic Society of Mid-Manhattan. He says he understands the pain and fear at this time of uncertainty, but wants Muslims to know the city will work to protect their rights. "I'll do everything in my power to work with the new president-elect and the new government in Washington to seek positive outcomes for this city, but I've also said when actions are taken against New York City's people, I will stand up and we all need to stand up and seek fairness," Mayor de Blasio said. The Islamic Society then presented the mayor with an artwork depicting an apple surrounded by flags from around the globe to symbolize the city's diversity.